Yes ... Greek food is simple but use of a variety of wonderful ingredients create one of our favourite styles of cooking. We even try to emulate it at home. Too much refinement is considered against the spirit of Greek cooking and speed is definitely not of the essence. Greek cuisine is typically Mediterranean and it shares characteristics with the neighbouring countries and regions of Italy, Turkey, the Balkans and the Levant. Much use is made of vegetables, herbs, grains, bread, wine, fish,and various meats. 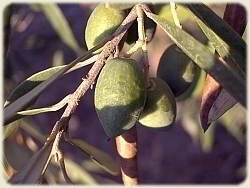 The ingredient that really makes the food Greek is olive oil and of course the olives from which it is made. I guess that is what makes it such a healthy diet. Greek cooking uses some flavourings more than other Mediterranean regions to give the food that special Greek foods taste. Desserts are not high on the list of priorities and you rarely get asked if you want one at a restaurant or taverna. There are a number of traditional soups made from chicken and others meats, vegetables or even from the wobbly bits of animals that are not commonly eaten. The climate and terrain of Greece, particularly the Islands, is such that it is more suited to the raising of sheep and goats than cattle. Therefore beef dishes are relatively uncommon. The most well known dish is souvlaki (kebab) but grills or stews are common. Poultry is also plentiful as they can live almost anywhere. On coastal regions and throughout the islands, fish is commonly available. Some can be expensive as a result of the labour intensive means of catching them (ignoring bomba fishing for now). Usually it is served grilled over charcoal. My personal favourite is a large plate of grilled or fried small fish (a bit like whitebait) served with Greek chips. That is what I always go for as a first meal each visit. For those of you that like meat and two veg, there are plenty of interesting vegetables. Such as aubergine, artichokes, beans, tomatoes, courgette, onions etc. But for those that only like veg and more veg, there are in fact quite a number of vegetarian dishes based on the local crops. Mrs. S, who is vegetarian, could live on the big butter beans alone. There are many cheese types to be found in Greece. For the same reason as the availability of meat, most cheeses are made from sheep or goats milk. Therefore you will not find the staple UK Cheddar style cheeses made from cow's milk. It is often used in mezes, salads and pies. Desserts are usually fairly limited but great for those that have a sweet tooth. Yoghourt with honey, Creme Caramel and Baklava are the most common. Wine is the most common drink in Greece. A nice chilled rosé goes down well with the Greek food, especially in the heat of the day. But watch out for some local ones which can be a bit sweet or taste of hangovers! The resinated Retsina is a matter of taste. We haven't got it yet! Cool beer is also everywhere. Mythos is my favourite. And of course ouzo, the anise flavoured drink. Greek coffee is like a very thick espresso and is usually drunk sweetened. All the grounds are left in the cup so there is a nice sludge at the bottom which if you are not careful gets sieved through your teeth. eating in Greece is a relaxed pleasure and not to be rushed. However there are some reasonably quick traditional foods which are available in a fast style. Gyros is one. Very common in Greece. 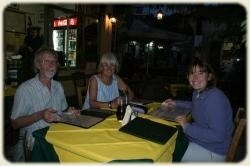 One of the great pleasure of a visit to one of the Greek Islands is to while away an evening in a harbour side taverna.